It’s been a time for Android users and OEMs alike of late, specifically with the news that Google’s mobile operating system has had a major security flaw ever since the Android 1.6 days. Considering that’s quite some time now, it has left many feeling somewhat uneasy about the state of security on the platform, and rightly so. Thankfully, Google has already gotten a patch out to its OEMs and some of those OEMs have begun to push that patch out to their handsets in double-quick time. One of those is Samsung, a company not previously known for its quick updates. But what if your device is not one of the lucky ones to have received an update quashing this particular security flaw? 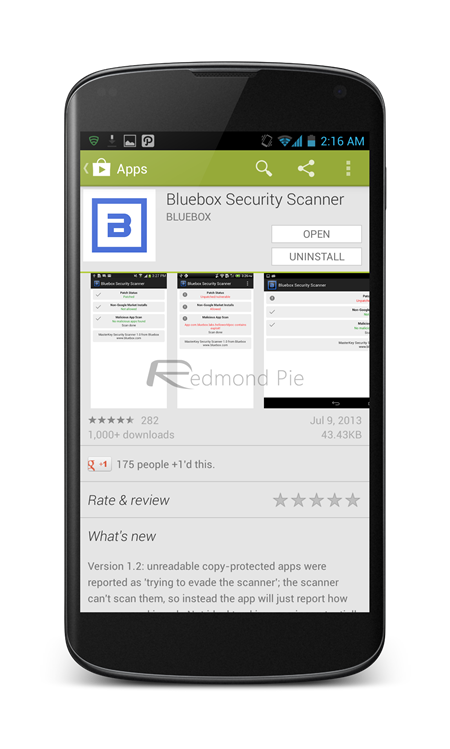 Thankfully, Bluebox Security, the people who actually discovered the issue in the first place, have launched their own free Android app that will scan the device it is installed on and inform the user whether that device is at risk from the so-called Master Key Exploit. Along with scanning for that particular exploit, the app will determine whether the device is at risk from installing non-Google Play apps, as well as scanning for already installed malicious apps. If you’re at all concerned about your device’s security, then it’s got to be worth downloading this free app. You’ve nothing to lose, after all. If there is one thing that is always thrown at Google’s Android then it’s a perceived lack of security, especially when compared with Apple’s much more closed iOS platform, or Microsoft’s Windows Phone for that matter. This latest security scare will not go any way towards helping that fact, but Google’s swift steps to correct the issue will be popular amongst users. Unfortunately, the way Android updates are rolled out to devices could lead to delays in those devices receiving this important correcting patch. With carriers and OEMs standing between users and them having one less security hole to worry about, this may not be an issue that goes away any time soon. 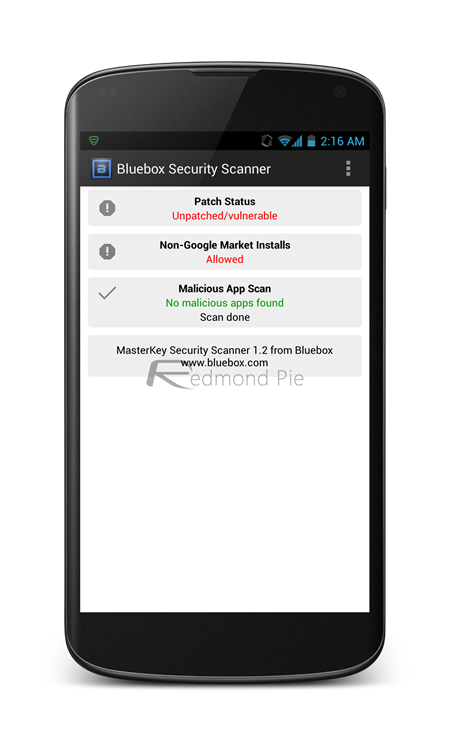 Anyways, download the Bluebox Security Scanner for Android app from the link given below and share with us if your device is affected with the flaw or not.